There is something about the woody scent of log cabins that it so synonymous with holidays and good times. Staying in a log cabin can be attractive in itself. Many people prefer the option of a log cabin rather than a cottage. Log cabins are so strongly associated with holidays that the thought of a stay in a log cabin can be truly appealing. Log cabins are also associated with cosy times together and are a romantic notion for many. Log cabins with the added attraction of hot tubs tend to be very much in demand. Having the added bonus of a hot tub can help to make a log cabin an even more of a romantic option. 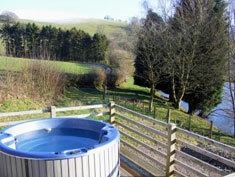 Imagine sitting in the outdoor hot tub on the right taking in the views over the Welsh hills. Log cabins very often also enjoy great settings. Some log cabins are set deep within forests whereas others enjoy beautiful countryside views. Some log cabins even have wonderful lakeside or lochside locations. Do bear in mind that some log cabins are in secluded settings on their own whereas others are on complexes with one or more other log cabins. Which you opt for may depend on whether you want to get away from it all or whether you like the company of others. Again, as with cottages, some cabins have their own private hot tubs whereas others have shared access to a communal hot tub. Another point to bear in mind is whether the hot tub is indoors or outdoors. A number of log cabins have hot tubs on an outdoor veranda so you can enjoy a degree of protection from the elements but can also enjoy outdoor views. Check ads for details of what each individual log cabin has to offer. It can be useful to write a checklist of your requirements when searching for a log cabin with a hot tub and note down which meet all your needs. Do call or email owners or agencies, they are there to help with your queries. Many log cabins enjoy country settings which can be particularly beneficial if you enjoy walking or rambling in the country. Do check ads for precise details of locations. Love the woody smell of log cabins? Adore the thought of a stay in a wooden chalet? Then how about a cabin with a hot tub, for that real holiday feel. Click on the photograph to view a selection of log cabin holidays with hot tubs in the UK and Ireland.